It's been almost 200 years since they roamed free in Indiana. Bison now roam the prairies of Kankakee Sands. Bison are just part of what one can view at Kankakee Sands. There are over 750 species of plants and 250 species of butterflies live in the prairie. This is one of the crown jewels of Indiana’s natural heritage. Indiana Chapter of the Nature Conservancy acquired 23 bison from another nature conservancy in South Dakota. These bison are now roaming free over 1,100 acres at the Kankakee Sands Nature Preserve in Newton County, which is in northwestern Indiana. To see bison roaming over a large restored prairie is something amazing. It took a lot of work, money and help from many people to accomplish this welcome event. The Nature Conservancy has been planting native prairie and marsh plants since 1997, slowly restoring thousands of acres from farmland to their native state. 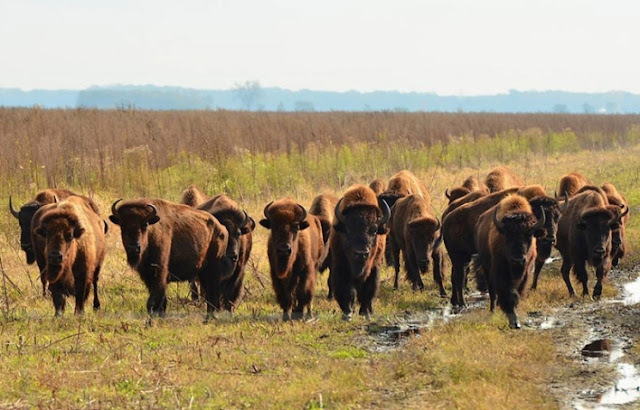 Earlier this fall, the first herd of bison were released onto the land. Now 23 bison roam the prairie. Aside from being super cool to watch, the bison also help with prairie restoration. They keep down tree saplings, which stop the prairie from becoming forest, they eat grasses but not native wildflowers, which lets those plants get ahead, and they cut furrows in the dirt with their hooves, which make seed dispersal easier. Responses to "Bison Are Running Free In Indiana For The First Time in Almost 200 Years"
What a wonderful story. I live in Indiana and I am proud to see a group working to return the land back to its original state. I love Bison and enjoy watching them and to know that they have returned is a really good thing. We also have a White Bison herd in their own Sanctuary in Amesville, Ohio...Grandfather Whitewolf, Ambassador of the White Bison Society. Have not been over there in a while and I remember no fences. What will keep the bison from running out????? Will we need wolves too? It is so right to see Buffalo roaming free on a restored prairie. These people seem to understand the Prairie the way we did. Little plots like this left on their own could regenerate the mighty herds of Buffalo and the majestic plains diversity of life. This land was not designed for single row crops, eventually the land gets hard panned aerobic bacteria and fungal life ends. With Buffalo there is a magical synchronicity of the power of life! It was my dream to see bisons leaving free. Greetings from Poland!